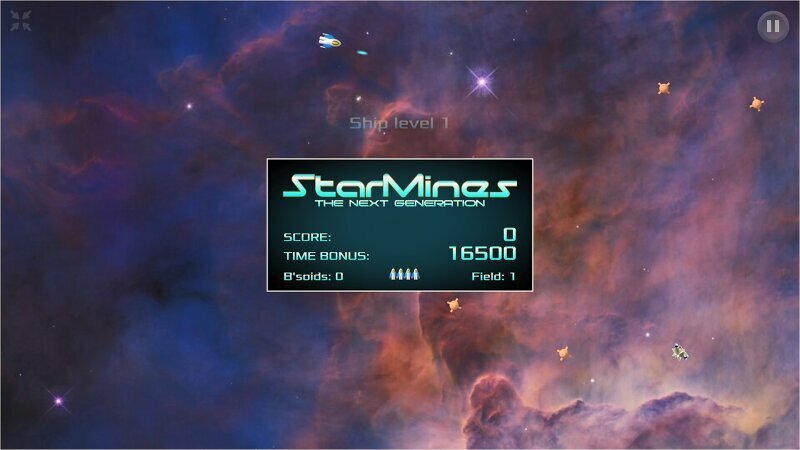 StarMines is a space shooter inspired by old classics like Asteroids and Omega Race. You are the spaceship pilot in search of magical Bonusoids which can only be found in the endless starmine fields full of dangers. 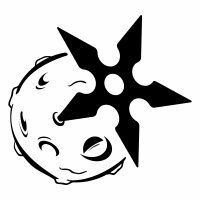 The more Bonusoids you catch, the better their magical forces make your ship. The game can be played on mobile with touch controls and on desktop with keyboard or mouse. On touch devices, there are different options for touch controls which you can choose from the top-right pause menu. Currently all the "Download" links lead to the online game. At least Chrome caches the content locally and can add a desktop icon as well as support off-line play on desktop and Android. Currently high scores will get lost in off-line mode, but otherwise it works. Like how easy the game is to understand, and the collisions work well. However I didn't notice my ship getting any better when collecting Bonusoids. Would be nice if there was some sort of power-up or way to improve your ship, perhaps a way to improve your weapons or a shield to protect against 1 hit or something like that. Also I feel like the ship moves really fast when you don't want it too sometimes, the acceleration is really quick. 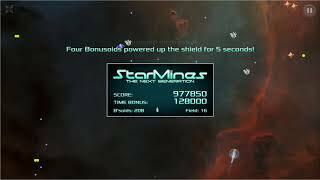 16 bonusoids give the first upgrade to weapons (range and firing speed are improved), and then 32, 64,100... it is a good point that the upgrades are not very noticeable, you see them best when you start from beginning without those upgrades. I have to think how to make it more clear, perhaps showing a counter to next upgrade? One hit shield could also be a good idea as an additional bonus, or perhaps as something to pick up. In a way this is the same thing as an extra ship, but it does not stack. I could try reducing the acceleration, must be careful that it does not become too sluggish. Today's version starts with reduced maximum speed and acceleration, upgrades bring them to the old level. This hopefully helps beginners in learning the controls. What was the problem with controls? What is your browser and OS? Cherome and Windows 10. I'm also uncoordinated becuase of hypermobile EDS and an Autism spectrum disorder. So try not to read too much into it. In my opinion, the x,z,n,m controls on a good keyboard are by far the best to play this game, these are closest to the original Asteroids console button layout. What do you mean when you say graphics clash with HUD quality? What kind of twists would bring it into the future? Placing a large unmovable block in the center of the screen that obscures the action doesn't do much to improve the look of the game. Also, it would help immensely to add some animations to the ship and maybe a parallax effect to the starry background.